Sunrises in Rocky Mountain National Park come in all shapes and sizes. Weather plays the greatest role in providing the drama of a brilliant sunrise in Rocky. On this particular morning in Moraine Park, a large group herd of Elk bugled a few hundred yards away as snow started to fly. 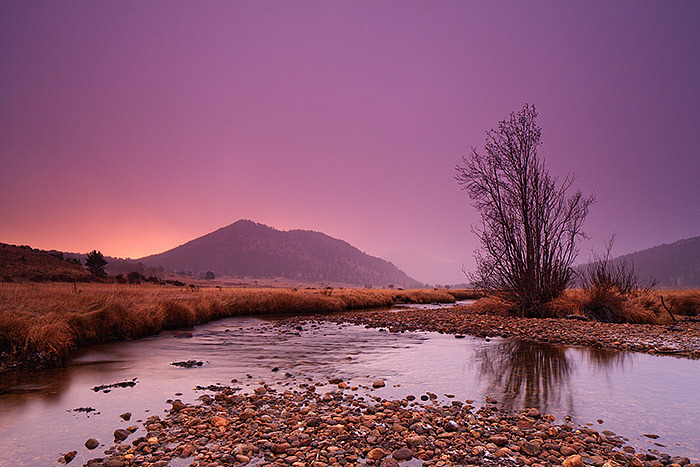 Just enough of the eastern horizon was open enough to allow a short window of color from sunrise to color the skies above Moraine Park and the Big Thompson River. Photo © copyright by Thomas Mangan.